“Sleeve Notes” – mostly based on Matt Seattle’s notes in the Great Northern Tune Book. The book contains all the Vickers tunes, notes on corrections and similar versions and an index. The number quoted after each tune title refers to the index number in The Great Northern Tune Book. Matt provides links to order the book here. Scans of the original manuscript can be viewed here. Then “search by person” and select “Vickers, William” from the dropdown menu. The Lily (461) A three part reel. I changed the ends of the parts a bit to get more flow. This has popped up in London and Scotland before Vickers and was attributed to William Marshall 80 years after Vickers noted it down! The Mad Frenchman (470) This one is in Eb, which is quite a mad key for the fiddle. Shona Mooney from Lauder has recorded a similar tune entitled Brendon Gardens, which she plays in A. The Drummer (80) Also found in other 18th Century manuscripts in Scotland, Yorkshire and London, not always with the same title. It’s a simple song melody so I got quite creative with the fiddle setting. The Basket of Oysters (102) Also called Green Sleeves. This has been played in different forms all over the British Isles. Here it is a simple jig with an “ancient” weirdness. Tumble Her Over Again (457) A typically bawdy Vickers title. There are no references to other manuscripts in Seattle’s notes and I’ve never heard this anywhere before. A Gm jig with a great groove and also works well on the Northumbrian pipes if played in Am. Jack’s Gone A-Shearing (115) A good 3/2 hornpipe and one of many tunes about Jack. Sunderland Lasses (128) Another 3/2. Seemingly Vickers is the oldest known version. It has similarities with the Lads of Alnwick but for me it’s different enough to be a tune in its own right. Canny Hobbie Elliott (444) – also known as a song, here it features as a 9/8 jig. Vickers has some semi-quaver runs in the B-part but I found they got in the way of the flow. Maybe they had a different way of doing these tunes back then. The Hemp Dressers (201) The first appearance of a similar tune was apparently in Playford’s Dancing Master, 40 years prior to Vickers making his collection. I suppose this is a jig, but I slowed it down to allow the beauty of the tune’s simplicity to shine. Lads of Saltcoats (554) Saltcoats is in Ayrshire. This tune leaves a fascinating trail, the earliest known written version being in Rutherford’s Compleat Collection…, published in London, probably around 1750. Vickers is the next oldest source. In the 19th Century it turns up as a Strathspey in several Scottish manuscripts. It took me a long time to settle on a way of playing this. In the end I changed the key from A to D and gave it a hefty swing. Sleepy Maggie (103) The two sources for this tune that predate Vickers are both Scottish manuscripts, but by far the most famous version of this reel these days is Jenny’s Chickens, popularised by the Irish-born fiddler Michael Coleman. Sair Fyel’d Hinny (not in Vickers). I was taught this song by Nancy Kerr and I arranged it for voice and fiddle in 2005. It was around when Vickers was compiling his manuscript and tells the story of an old man lamenting the fact that the oak tree grow stronger with age, while he grows weaker. The melody of the song has the same modal quirks that many Vickers tunes exhibit. The Sudden Thought (3) Working on the premiss that nobody ever looks at the first page of a book, I had a look at this one and it reminded me a bit of Whinshield’s Hornpipe. Vickers appears to be the only written source for this tune. Life of Man (22) This tune is related to many tunes with many different titles, mostly found in Scottish manuscripts. Lads of Our Alley (91) Found all over the British Isles, including an “untitled” reel played by Tommy Peoples in Ireland. I love the title! Sherriff’s Whim (557) This very lyrical tune in F also turns up in Thompson’s Collection in London around the same time. Fiddler’s Maggot (45) Seattle supposes that this must be a 2/4 version of Fiddler’s Jigg (44), which in turn appears to be a version of a composition by John Riddell of Ayr that got bashed about on its way to Tyneside. To me, it sounds almost Swedish in this form. Country Dance – By Shields (545) Also great on Northumbrian Pipes (in G, for example), for me this is reminiscent of Because He Was a Bonny Lad but with much more movement. The title leads some to suggest it to have been composed by a young William Shield (he would have been 22 in 1770). I personally imagine Vickers to have collected the tune “by Shields” near the mouth of the Tyne. Lady Mackintosh’s Reel (73) Despite being really nice as a reel, this felt like it was maybe a Strathspey in an earlier life, so I zapped it with some snaps and driven bow. It turned up in a London manuscript in the 1750s and in Edinburgh in the 1760s. The Confederacy (322) Also found in the Caledonian Collection, published in London 30 years before Vickers. This obviously can’t be a reference to the American Confederate States, as that was almost a century later. The title more likely refers to the Irish Catholic Confederation, which was a government formed by Irish nobilty following the Irish Rebellion in 1641. They were loyal to British (Catholic-leaning) Monarchs Charles I & II but defeated by Cromwell in 1649. With a story that complicated, no wonder the B-part has so many notes! There is a fleeting resemblance to Burns’ You’re Welcome Charlie Stuart! in the A part. It was written around at the same time but Seattle points out that it is more the chords than the tune that are similar. The Sailors Is All at the Bar (70) Northumberland and the Borders area have some really mysterious sounding tunes and this is one of them! Vickers obviously had some trouble notating the mode, so I’ve trusted the editing in the published edition. Sounds good to me. Ducks Dang Ower My Daddy (60) In 1684 it turns up as Buff Coat in the English Dancing Master (London) and in 1694 in Henry Atkinson’s manuscript in Newcastle. Later it turns up in Scotland and then as Irish Show Boy in….Chicago! Gallop and Shite (118) Also named in Vickers as The Cow’s Corrant (a far inferior title), this jig appears in manuscripts all over the British Isles in various forms, the closest being The Highway to Dublin (published by John Rooke in Cumbria, 1845) and there is a vague similarity to Langstrom’s Pony. But Vickers appears to be the earliest known transcription. Kitty Will You Marry Me Kate? (131) This obviously became popular in Scotland in the 19th Century as The Bristled Beard, among other titles. It was also played as a Strathspey. A decade or two after Vickers a similar tune was notated as a song in Edinburgh. Devil in a Bush (100) Appears in London in Rutherford’s collection around 1750 as The Parson in Ye Sudds. James Gillespie in Perth noted it down in 1768 as Kurcaldrum’s Reel. Hexham Lasses (122) Despite the obvious Northumbrian reference in the title, Simon Fraser transcribed it as a Highland pipe reel under the name “The Bedding of the Bride” in Edinburgh, 1816. The West Indian (448) Seaton Sluice fiddler, Stewart Hardy, who has pulled many a good tune out of the Vickers manuscript, taught me this tune years ago. It’s a Newcastle Style hornpipe ahead of its heyday. The West Indian was, intriguingly, also the title of a play performed in London’s Drury Lane Theatre in 1771 – The very theatre where, in 1740, a dancer called Yates is credited as having made the now popular link between hornpipes and sailors, as the character Jack Tar’. Sailor’s Delight (368) This tune was just too weird not to include. 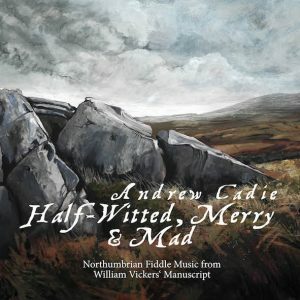 There are no references to other manuscripts and to me, this 9/8 jig fits in well with other Northumbrian tunes like The Peacock Followed the Hen or Shew Us the Way To Wallington. The Cellar Door Key (377) This is clearly a version of the melody from the Jacobite song Cam Ye O’er Frae France, which mocks the court of the protestant King, George I of Hanover. Here, it appears as a dance tune, as in several Scots manuscripts from the 18th Century.